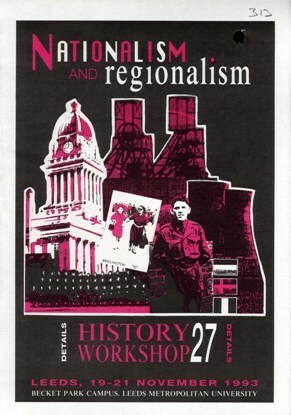 History Workshops were annual forums held between 1967 and 1994. They were devoted to the study and development of ‘history from below’ for use as a weapon in left-wing political campaigns. The movement was founded by Raphael Samuel, a tutor in History at Ruskin College. Samuel and others organised the first Workshop, held at Ruskin in March 1967. The name ‘History Workshop’ – inspired by Joan Littlewood’s Theatre Workshop – made clear the socialist heritage and aims of the movement. The Workshop was in part a product of the New Left, a leftist tendency which had emerged in opposition to Soviet-aligned communism following the suppression of the Hungarian uprising in 1956. Also influential was the student movement of the late 1960s, although relations between university students and academics and the worker-students and trade unionists who made up another part of the Workshop’s constituency were often tense. All of these groups had a shared interest in the development of a new strain of leftist history unconnected to old ideologies. This was to be a history of ordinary people studied in partnership by academic and lay researchers for use as an inspiration and a pattern for current political struggles. In the late 1960s, the influence of the Women’s Movement was growing within the Workshop as elsewhere. It was from a meeting held in a student bedroom at Ruskin during Workshop 4 in 1969 that the first Women’s Liberation Conference in Britain – held in 1970 – developed. 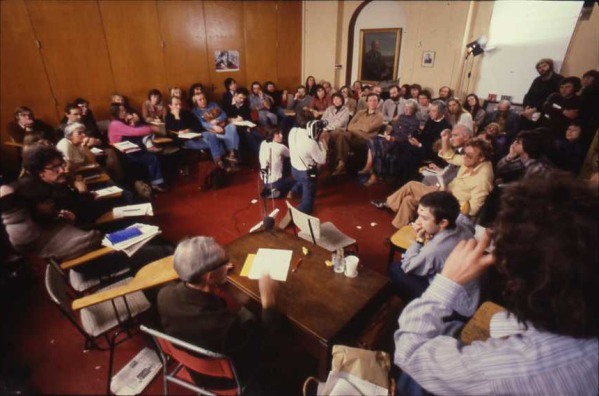 A sequence of three History Workshops held in 1972 and 1973 were devoted to subjects influenced by feminist scholarship, and all Workshops thereafter had a strong contingent of feminist speakers. Tensions within the History Workshop movement led to its departure from Ruskin after the 1979 event. By this time, the Workshop claimed to be the largest history conference in Britain, with Workshops regularly attracting at least 500 people, and sometimes as many as 2000. An annual event on this scale was felt to be unsustainable by the college students and authorities. At the same time, it was felt by some that the tone of certain sessions had become too academic and theoretical. From 1980 onwards, the Workshop became an itinerant event, held at universities, polytechnics, and adult education colleges around the country. This phase coincided with an expansion in the representation of local history groups within the Workshop movement. The 1980s was a period of intense conflict in Britain, as the Thatcher government mounted a sustained campaign against the left and the labour movement. Anger against Thatcher provoked historical work within history workshop, including thematic History Workshop groups, local history and oral history activities, and publications. At the same time, the rising influence of post-modernism led to a ‘linguistic turn’ in much historical work, including by some members of the History Workshop movement. Structural changes within British society and in particular British higher education contributed to the decline of the History Workshops. The huge expansion of university attendance which had taken place from the mid 1960s onwards meant that the crucial contingent of participants in the workshops who had come to history through self-education and through extra-mural studies and the Workers Education Association was now much smaller. Younger people who might once have come to History Workshop through these routes now had other openings. Moreover, the new kinds of history promoted by History Workshop had become much less marginal. Many of the frequent speakers and organizers of History Workshops now had jobs as academic historians, showing the acceptance of their form of history, but also meaning that they had less time to organize Workshops or to come and speak at them. The publication of History Workshop Journal, rather than the organization of Workshops, became a priority for some. Meanwhile the existence of new forms of history in print, including in History Workshop Journal, made it possible to find out what was going on without attending a Workshop. Meanwhile a new managerialism arose in universities, partly in response to budget cuts during the Thatcher period. It became increasingly difficult to find free premises for events on the scale of the workshops. This made it more difficult for supporters to organize workshops, especially as attendance at some of the later workshops was smaller than it had been at the movement’s peak. The final phase of the History Workshop movement took place against the backdrop of the end of the Cold War and the demise of the Communist regimes of Eastern Europe. A series of Workshops grappled with the new realities of European politics, but the factors described above made it difficult to continue with the Workshops. The last Workshop (the 28th) was held in 1994. A conference on ‘Scottish Dimensions’ sponsored by History Workshop Journal and Ruskin College was held in 1995, but the promised Workshop 29 at the Co-operative College in 1996 never took place. You can view a wide variety of the materials from the History Workshop archive below. To optimise your viewing, you can adjust the size of the embedded images by clicking on them twice. You can use your PC browser to zoom in to see the detail by clicking Ctrl + or Ctrl -, or by clicking on ‘View’ in the main toolbar in the upper left hand corner of your screen and then scrolling down to click on ‘Zoom’. A sub menu will pop up and you can then choose to ‘Zoom Out’. If you are using a Mac, you can use Command+Option+= to zoom in and Command+Option+- to zoom out. 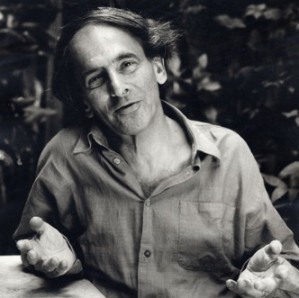 Is there any record of the History Workshop held at Queen Elizabeth House, Oxford, on 12 May 1984, 10 a.m. to 6 p.m., entitled “Visual Documentation: Images of Colonized Peoples”? I recall this as an extremely stimulating event which sparked off a significant movement in research on visual archives, influenced originally by the work of John Berger and Edward Said. From what I remember, Linda Nochlin gave a paper, following her 1983 article “The imaginary Orient”. I am writing about the ‘crisis of representation’ which gathered force during the 1980s and would like to give due credit to this workshop.